The web content was authored by Neil Lazarow and Tim Capon. Lazarow, N., Capon, T., 2016: Valuation of adaptation options relative to the avoided impacts. CoastAdapt, NCCARF, Gold Coast. Valuation of adaptation options can help to support the adaptation decision-making process. Choosing a fit-for-purpose approach depends on the decision-making context, the level of uncertainty present, availability of resources and skills, timeframes, and community expectations. This guide discusses the factors that need to be taken into account in selecting a fit for purpose valuation approach, and helps you to choose the best valuation method for the task in hand. A decision tree is provided that helps you step through a series of questions to define the most appropriate valuation tool or approach for your purpose. In addition, the snapshot AdaptWater: A climate change adaptation tool for the urban water industry describes an application of cost-benefit analysis. Adaptation decision-making is characterised by uncertainty. This uncertainty challenges many traditional valuation tools, which lack the sophistication to deal with the uneven distribution of costs and benefits over time. This guide aims to assist the reader step through the process of choosing valuation approaches that are fit for the purpose of the adaptation decision. The tools discussed here are exactly that—tools to support decision-making. No tool is perfect, each has advantages depending on how and to what end it is used. Many of the tools are complementary in nature and can be used sequentially and iteratively as an adaptation pathway (see Pathways approach) is developed and refined over time. Some examples are described below to illustrate this. Adaptation decision-making tends to follow an iterative process that is based on the principles of adaptive management (see Figure 1). This enables decision-makers to take into account the range of uncertainties related to future states (see Understanding climate scenarios). The starting point for a valuation study is generally not the same as the starting point for a decision. As Figure 1 illustrates, valuation studies form part of the cycle of decision-making. Choosing a fit-for-purpose valuation method depends heavily on the decision-making context, the level of uncertainty present, and the requirements for stakeholder engagement. This guidance assumes that the reader has identified that there is a problem of significance that needs to be addressed through adaptation measures. In other words, the identification of challenges (i.e. context setting) and the determination of vulnerabilities (i.e. gathering of information on all risks) will already have been undertaken to some extent before commencing a valuation study. If you are using the C-CADS model (Figure 1), we assume here that you have completed the first step of C-CADS (Figure 1) and made a start on the second step of C-CADS. This guide can be used independently of C-CADS. Figure 1: CoastAdapt – Coastal Climate Adaptation Decision System. Source: NCCARF. When framing and undertaking a valuation exercise, you need to begin with two questions. Do I have all the information I need in the right form and quality to proceed? Can all values be monetised (and should they)? Do I have the right information to proceed? Information is valuable, however, it often comes at a cost and may be limited at the time a decision needs to be made. Careful thought should be given to the costs and benefits of seeking new information (the reader is referred to the Information Manual 4: Cost and benefit for a more detailed discussion on this). The type, time and quality of information will underpin the quality of inputs to any valuation exercise. Gorddard et al. (2015) propose an approach to help frame the questions that need to be asked, the Values-Rules-Knowledge framework. Is there broad consensus on the vision? Is there agreement across stakeholder groups on options? Is there certainty of knowledge relating to existing hazards? Is there certainty of knowledge relating to future hazards / risks? At the broadest level, determining where a decision point rests across these three axes (Figure 2) can indicate what level of detail is appropriate for a valuation study, and where to start (see Table 1). For example, if there is significant community conflict over the nature of a proposed solution (e.g. protect or retreat), or if there is a high knowledge deficit (dots 1 and 2 in Figure 2), then more work on knowledge and community values is needed before a valuation study can begin. In fact, the introduction of a Cost-Benefit Analysis (CBA) at such a time may entrench polarised views rather than resolve any differences. However, if there is good knowledge, values are aligned and the regulatory framework is clear, then valuation studies are appropriate and can assist decision-making. When scaled out to the future, and then brought back to net present values, relatively small changes in assumptions can impact the results of valuation studies. Where lack of knowledge about future states (e.g. future climate, future property prices etc.) is a feature of a valuation study then sensitivity analyses (see Using climate scenarios) can help to investigate the consequences of changes and errors in parameter values and assumptions (see Information Manual 4: Costs and benefits). Figure 2: Values Rules Knowledge Framework. Source: Adapted from Gorddard et al. 2015. Goods and services that are traded in the market can generally be monetised directly or approximate monetary values can be derived through a number of different approaches and low-cost methods such as asset replacement cost and benefit transfer (see Table 2). A number of approaches have also been developed to generate monetary values for non-traded goods and services and for which no proxy value is readily available. Such tools depend on either revealed or stated preferences (also known as contingent valuation) being elicited from a set of users. With revealed preference or indirect valuation methods, the value of a non-traded good or service is determined by the creation of a parallel or surrogate market. Commonly used tools include the Travel Cost Method and Hedonic Pricing. With stated preference or direct valuation methods, a set of people are directly asked about their willingness to pay or willingness to accept a change of some sort. Choice Modeling is a commonly used tool. Refer to Table 2 for further information on each of these valuation approaches. A more philosophical debate exists around whether the pricing of non-traded goods and services— such as spiritual values or even some ecosystem services such as beautiful views or the bequeathement value of national parks— should ever be monetised. One line of argument is that this diminishes their intrinsic value and makes these Earth system and iconic features subject to a debate about trade-offs. It is also the case that using the ‘trump card’ argument based on intrinsic values is not a cost free decision, and some judgement is required on the acceptability of this social cost. For example, is it more important to conserve the intrinsically valued asset and give up a development option, or to protect the intrinsic landscape from sea-level rise? In contested contexts such trade-offs are often inevitable (despite deliberation efforts) especially if one or more interest groups seek to play the ‘trump card’ tactic. Depending on the nature of particular decisions, there is likely to be high value in sequencing of tools and even using them iteratively through a decision lifetime as knowledge changes and values evolve. This is well illustrated through the Values-Rules-Knowledge prism (Figure 2) described above. For example, engaging stakeholders in a meaningful way and representing their views and values in the development of future scenarios (see description in Table 3) can help you to consider ‘acceptable’ adaptation options that would then undergo a more detailed assessment. For example, deliberative tools such as Multi-Criteria Assessment (see Table 3) may be used to establish preferences between options in advance of a more detailed valuation study. Decision support tools can also be used to establish (environmental, economic or social) thresholds and future trigger points (e.g. loss of a certain percentage of beach and dune, dam water levels) under which future options need to be more fully examined (e.g. narrowing of options, change of course) or implemented (e.g. Haasnoot et al. 2013 who discuss the concept of adaptation pathways in detail; Wise et al. 2014; Pathways approach). 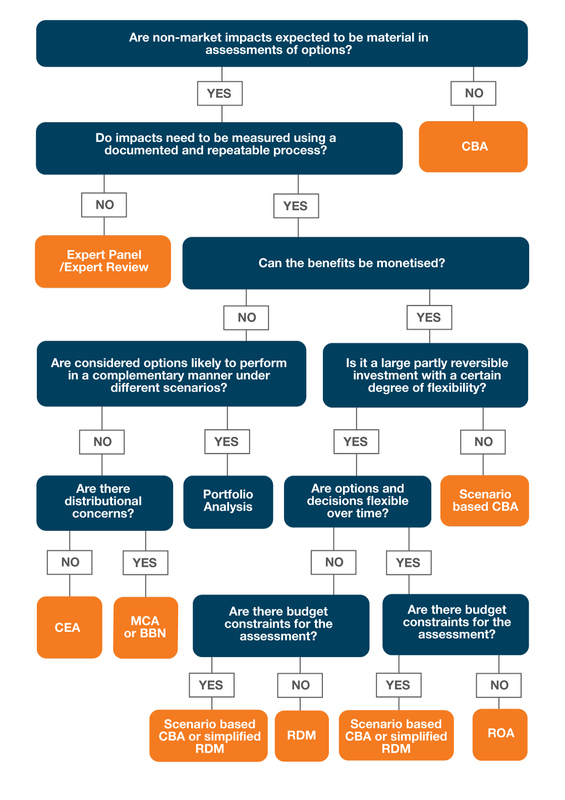 Figure 3 and Table 1 below provide an easy to use decision tree that helps you step through a series of questions to define the most appropriate valuation study to support an adaptation assessment, and recommends a particular tool or approach. The tools and approaches are then described in more detail in Table 3. A number of points are worth noting. Decision-making for adaptation investment is differentiated from more traditional approaches by the uncertainty attached to future impacts and benefits. This has prompted various principles-based investment frameworks along the lines of ‘no regrets’, ‘low regrets’ and ‘win-win’ to guide investment. In many cases these will lend themselves to an iterative approach whereby some decisions can be made with limited information / low granularity, whereas other decisions are best postponed or made flexible until more information about risks and impacts is available. As with more traditional approaches, the use of multiple tools can greatly benefit the decision-making process e.g. to monetise non-market costs and benefits, or to capture and prioritise options. A number of commonly used prioritising / sorting tools are also described in Table 3. Finally, it must be accepted that different approaches will serve different circumstances and this depends on the context and nature of the problem and possible options, the value of available data, whether timeframes are flexible, appetite for risk, and not least of all, the skill / skills available to the decision-maker. Figure 3: Matching the valuation approach to the decision context. Source: Adapted from DEFRA 2013; Dittrich et al. 2016; Hatfield-Dodds 2005. Table 1: Identifying the best adaptation assessment method (refer to Table 3 for a description of the tools and approaches). Source: Adapted from: DEFRA 2013; Dittrich et al. 2016. Table 2: Commonly used approaches to generate monetary values for non-traded goods and services. Additional sources: Anning 2012; Lazarow et al. 2013. Table 3: Summary of commonly used prioritising / sorting and valuation approaches. 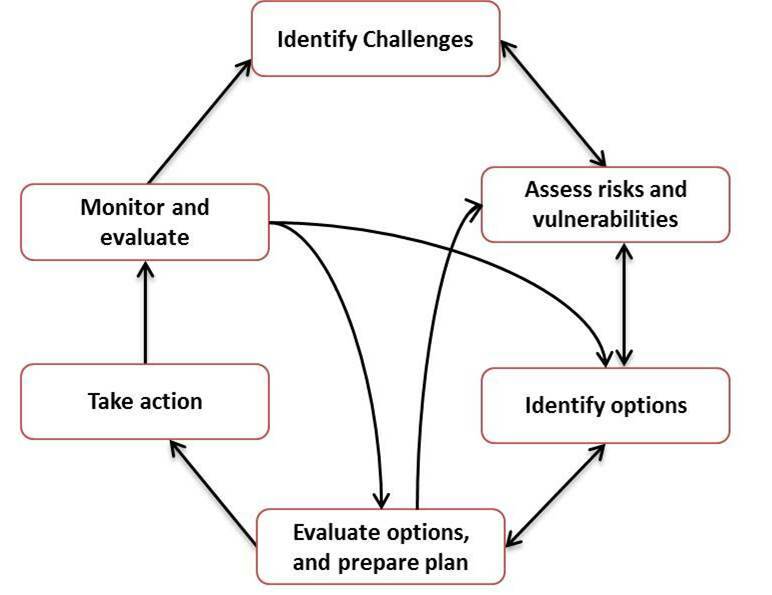 ACIL Tasman, 2012: Climate Change Adaptation Options Assessment. Developing flexible adaptation pathways for the Peron-Naturaliste Coastal Region of Western Australia. [Available online at https://www.nccarf.edu.au/localgov/sites/nccarf.edu.au.localgov/files/casestudies/pdf/Case%20Study_Developing%20Flexible%20Adaptation%20Pathways%20for%20the%20Peron%20Naturaliste%20Coastal%20Region%20of%20WA%202011_2012.pdf. Anning, D., 2012: Estimation of the economic importance of beaches in Sydney, Australia, and implications for management. Faculty of Science, University of New South Wales. Accessed 27 May 2016. [Available online at http://www.unsworks.unsw.edu.au/primo_library/libweb/action/dlDisplay.do?vid=UNSWORKS&docId=unsworks_10467]. Better Evaluation, 2014: Cost Effectiveness Analysis. http://www.betterevaluation.org/evaluation-options/CostEffectivenessAnalysis. Accessed 26 April 2017. Crowe, K., and W. Parker, 2008: Using portfolio theory to guide reforestation and restoration under climate change scenarios. Climatic Change, 89, 355-370. DEFRA, 2013: The economics of climate reslience: appraising flood management initiatives - a case study CA0401. A report prepared for DEFRA and the Devolved Administration. Accessed 27 May 2016. [Available online at http://randd.defra.gov.uk/Document.aspx?Document=11234_CA0401-ECRAppraisingfloodmanagementiniatives-acasestudy.pdf]. Dittrich, R., A. Wreford, and D. Moran, 2016: A survey of decision-making approaches for climate adaptation: Are robust methods the way forward? Ecological Economics, 122, 79-86. GHD, 2012: Economic Analysis: Coastal Hazard Strategy for Townsville City Council [Pilot Project]. [Available online at https://www.townsville.qld.gov.au/__data/assets/pdf_file/0012/7032/Appendix_B-Economic-Analysis.pdf]. Gorddard, R., M. Colloff, R. Wise, D. Ware, and M. Dunlop, 2015: Values, rules and knowledge: Adaptation as change in the decision context. Environmental Science and Policy, 57, 60-69. Griffith Centre for Coastal Management, 2013: Assessment and Decision Frameworks for Seawall Structures. Appendix C: Economic Considerations. Prepared for Sydney Coastal Councils Group. [Available online at http://www.sydneycoastalcouncils.com.au/sites/default/files/appendix_c_economic_considerations.pdf]. Groves, D., and C. Sharon, 2013: Planning Tool to Support Planning the Future of Coastal Louisiana. Journal of Coastal Research, 147-161. Groves, D., E. Bloom, D. Johnson, D. Yates, and V. Mehta, 2013: Addressing Climate Change in Local Water Agency Plans: Demonstrating a Simplified Robust Decision Making Approach in the California Sierra Foothills. Accessed 27 May 2016. [Available online at http://www.rand.org/content/dam/rand/pubs/research_reports/RR400/RR491/RAND_RR491.pdf]. Haasnoot, M., J. Kwakel, E. Walker, and J. ter Maat, 2013: Dynamic adaptive policy pathways: A method for crafting robust decisions for a deeply uncertain world. Global Environmental Change, 23, 485-498. Hatfield-Dodds, S., 2005: Decision support for highly contested choices: The role of monetised values and other metrics in the pursuit of sustainability. Paper presented at the ANZSEE 2005 Conference, 11–13 December, Palmerston North, New Zealand. Accessed 27 May 2016. [Available online at https://www.researchgate.net/publication/265786307_Decision_support_for_highly_contested_choices_The_role_of_monetised_values_and_other_metrics_in_the_pursuit_of_sustainability]. Hunt, A., and P. Watkiss, 2013: Portfolio Analysis: Decision Support Methods for Adaptation, MEDIATION Project, Briefing Note 5. Accessed 27 May 2016. [Available online at https://www.sei-international.org/publications?pid=2399]. International Institute for Environment and Development, n/d: Profiles of Tools and Tactics for Environmental Mainstreaming. Draft for Comment. No. 9 Scenario Planning. Accessed 27 May 2016. [Available online at http://www.environmental-mainstreaming.org/documents/EM%20Profile%20No%209%20-%20Scenario%20Planning%20(6%200ct%2009).pdf]. Lazarow, N., M. Raybould, and D. Anning, 2013: Beach, Sun and Surf Tourism. The handbook of tourism economics: analysis, new applications and case studies, C. Tisdell, Ed., World Scientific Publishing Company. McCann, R., B. Marcot, and R. Ellis, 2006: Bayesian belief networks: applications in ecology and natural resource management. Canadian Journal of Forest Research, 36, 3053-3062. Preston, B., M. Maloney, D. Thomsen, R. Mangoyana, and T. Smith, 2012: A Multi-Criteria Analysis of Coastal Adaptation Options for Local Government. Prepared for the Sydney Coastal Councils Group by Oak Ridge National Laboratory and the University of the Sunshine Coast, Oak Ridge, Tennessee and Sippy Downs, Queensland. Accessed 27 May 2016. [Available online at http://www.sydneycoastalcouncils.com.au/sites/default/files/MCA_of_Coastal_Adaptation_Options_for_Local_Government.pdf]. Raybould, M., and N. Lazarow, 2009: Economic and social values of beach recreation on the Gold Coast. Sustainable Tourism Cooperative Research Centre. Accessed 27 May 2016. [Available online at http://www.valueofwaves.org/uploads/1/1/4/2/11420190/100054_raybould_econsocvalbeachesgc_web.pdf]. Raybould, M., D. Anning, D. Ware, and N. Lazarow, 2013: Beach and Surf Tourism and Recreation in Australia: Vulnerability and Adaptation. FRDC 2010/536, 132 pp. Fisheries Research and Development Corporation and Bond University. Accessed 8 January 2018. [Available online at http://epublications.bond.edu.au/business_pubs/723/]. SGS Economics and Planning, 2012: Tasmanian Coastal Adaptation Pathways Project. Documentation of Methodology. A report for the Local Government Association of Tasmania. Accessed 8 January 2018. [Available online at http://www.dpac.tas.gov.au/__data/assets/pdf_file/0017/229130/Example_Interim_Local_Area_Report_Coastal_module_3.PDF]. Stewart, M., X. Wang, and G. Willgoose, 2014: Direct and Indirect Cost and Benefit Assessment of Climate Adaptation Strategies for Housing for Extreme Wind Events in Queensland. Natural Hazards Review, 15, 33. Tainio, A., and Coauthors, 2014: Conservation of grassland butterflies in Finland under a changing climate. Regional Environmental Change, 16, 71-84. United Kingdom Government, 2009: Multi-criteria analysis: a manual. Department for Communities and Local Government, London. Accessed 27 May 2016. [Available online at http://eprints.lse.ac.uk/12761/1/Multi-criteria_Analysis.pdf]. Walker, C., B. Blackwell, and J. Rolfe, 2012: Value and Equity Framework for Climate Adaptation: Coastal Caravan and Camping Parks. Research Report 2. Accessed 27 May 2016. [Available online at http://www.wcb.vic.gov.au/projectcaravan.html]. Watkiss, P., A. Hunt, and W. Blyth, 2013: Real Options Analysis: Decision Support Methods for Adaptation, MEDIATION Project, Briefing Note 4. Accessed 27 May 2016. [Available online at http://www.mediation-project.eu/platform/pbs/pdf/Briefing-Note-4-LR.pdf]. Wise, R., and T. Capon, 2016: Assessing the costs and benefits of coastal climate adaptation. CoastAdapt Information Manual 1, National Climate Change Adaptation Research Facility, Gold Coast. Accessed 27 May 2016. [Available online at http://coastadapt.com.au/information-manuals/assessing-costs-and-benefits-of-coastal-climate-adaptation]. Wise, R., I. Fazey, M. Stafford-Smith, H. Eakin, A. v. G. E, and B. Campbell, 2014: Reconceptualising adaptation to climate change as part of pathways of change and response Global Environmental Change, DOI: 10.1016. Watkiss, P. and A. Hunt, 2013: Method Overview: Decision Support Methods for Adaptation, Briefing Note 1. Summary of Methods and Case Study Examples from the MEDIATION Project. Funded by the EC’s 7FWP. Accessed 27 May 2016. [Available online at https://www.sei-international.org/publications?pid=2395].